IF the Workhouses in other Places answer, in Proportion to what ours has done, there will be little Need to press People to set them up in all Places that are proper; for except the Poor are numerous, they will scarce turn to Account, but by two or three Parishes joining. THE Workhouse here began in 1727, before which Time we generally paid 7 or 800l. per Annum to the Poor: We soon sunk to 5, and 4, and the 2 last Years have been considerably under 400l. We have had 190 Persons in the House at a Time, at present not above 70, and have earned by them, from 6l. to 12l. per Month. Our Advantage is, that in the Cloathing Business we can employ all from 7 Years old to 80. A parliamentary report of 1777 recorded parish workhouses in operation at Bradford (for up to 140 inmates) and Little Chalfield (16 inmates). In 1784 an Act was passed enabling the parish to appoint a general overseer, with a salary of £100. Mr. Rainey, a gentleman of considerable property, has always filled the office, but he accepts only £60 a year. The Poor are relieved at home, or maintained and employed in a Workhouse, which though old has been much improved by him. The apartments are now exceedingly neat and comfortable; the Poor are kept clean and well fed, but are made to work or are punished. If the Out-Poor are idle or get drunk, otherwise misbehave, or refuse to send their children to service at a proper age, they are ordered into the house. Badging the Poor is supposed to have reduced the rates. Mr. Rainey from his knowledge of law often prevents useless litigation; and, being well acquainted with the character and circumstances of every person who applies for relief, can discriminate very fairly between self-created and undeserved poverty. Course of diet in the Workhouse: Breakfast—every day, onion broth made of water, onions, oatmeal and fat of meat broth; no meat broth used. Dinner—Sunday, Tuesday, Thursday, meat and vegetables ; other days, bread and cheese. Supper—every day, bread and cheese. 2lbs. of bread are allowed every day to those who work out of the house, and 1½lbs. to those who spin. Children receive a quantity proportionate to their ages. The cheese is not weighed. County of Wiltshire: Atworth, Bradford (6), Broughton Gifford (2), Great Chalfield, Holt, Leigh Wooley, Limpley Stoke, Little Chalfield with Cottles, Monkton Farleigh (2), South Wraxhall [Wraxall], Trowle (Tything), Westwood (2), Winkfield [Wingfield] with Rowley (2), Winsley. The population falling within the Union at the 1831 census had been 12,660 — with parishes ranging in size from Little Chalfield with Cottles (population 83) to Bradford itself (3,352). The average annual poor-rate expenditure for the period 1831-4 had been £10,112 or 16s.0d. per head of the population. 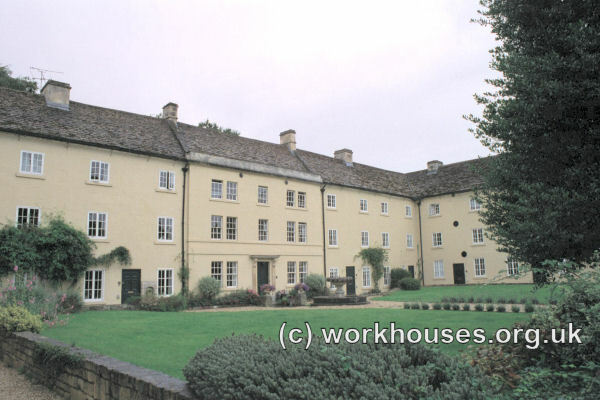 The Bradford Union workhouse at Avoncliff is thought to date originally from about 1792 and the larger part of the U-shaped building originally comprised seventeen individual industrial dwellings, each one bay wide and three storeys high. In 1836 the Poor Law Commissioners authorised an expenditure of £3,000 on purchase of the building which was intended to accommodate 250 inmates. In 1837, a further expenditure of £1,986 was approved for extending and adapting the building, including the opening up of many of the internal dividing walls. The workhouse Master's quarters were at the centre. Female inmates were accommodated at the east and males at the west. The site layout and location are shown on the 1901 map below. Bradford-on-Avon from the north-east, 2000. 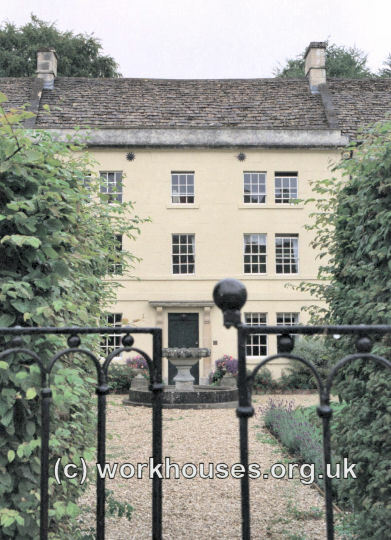 Bradford-on-Avon entrance gate and Master's quarters from the north, 2000. An entrance lodge, now demolished, was erected at the northern side of the courtyard. Bradford-on-Avon main range from the north-east, 2000. 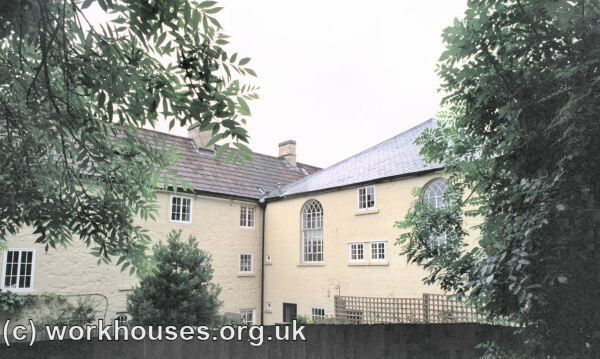 A block added at the rear contained the workhouse kitchen, dining-hall and chapel. 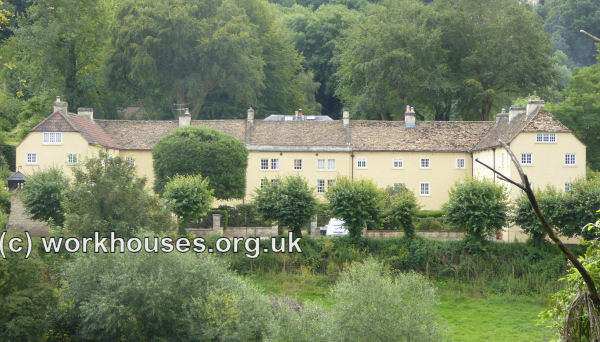 Bradford-on-Avon rear of main block from the south-west, 2000. In the latter part of the nineteenth century, a school block was erected at the south of site. The Avoncliff workhouse had originally been weavers' cottages. A small pre-1834 building to the rear of the site, just south of the workhouse, is thought originally to have been a drying-house. It may later have been used as a refractory cell for misbehaving workhouse inmates. 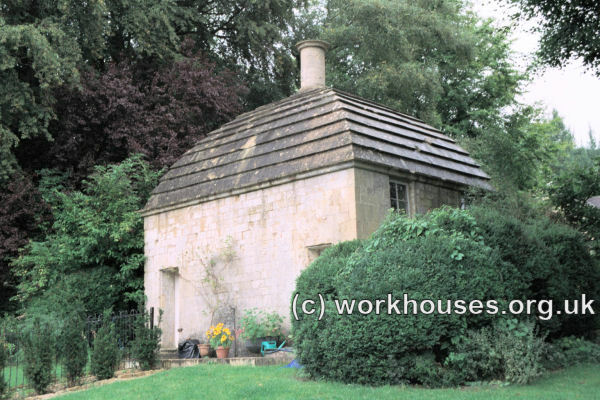 Bradford-on-Avon drying-house / refractory cell, 2000. The workhouse was closed in 1917 and the few remaining inmates were transferred to the Warminster workhouse. The building was then rented by the Red Cross but in 1923 was sold to Walter Morres for use as a hotel called the Old Court. This involved the demolition of the gatehouse and part of the east wing. From the 1950s, the building has gradually been converted for residential use. Avoncliff Red Cross Hospital, Bradford-on-Avon c.1918. Wiltshire and Swindon Archives, Wiltshire and Swindon History Centre, Cocklebury Road, Chippenham SN15 3QN. Few records survive — holdings include: Guardians' minutes (1914-30); PLC orders (1835,1837); Photographs (1930); etc. The Victoria County History of Wiltshire (OUP).